The boys basketball team huddles together before facing against Rockville on January 25. Photo credits to Nyawa Allieu. 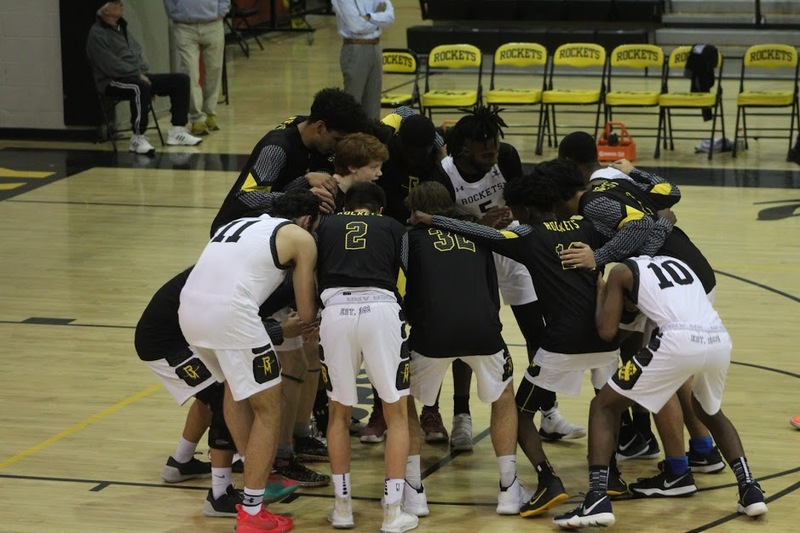 The Richard Montgomery boys basketball team improved to their record to 13-0 on Friday, Jan. 25 against their rival Rockville. This was a game was a must-win for the Rockets, not only to continue their undefeated season, but also to gain bragging rights for when they play Rockville again next week. Fortunately, they came out victorious, and will be looking to build on their win to maintain their perfect record. Unsurprisingly, the gym was full of spectators on both sides. The RM faithful were dressed in gold and black, while the Ram fans were in orange on the opposite side. The Rockets ended up controlling the tip, and their offense was ready to put up points. At just two minutes into the first quarter, the Rams had already jumped out to a 4-2 lead, but the Rockets quickly came back with a 10-0 run with points scored by junior guard Devon Liyanamana, sophomore guard Kordell Lewis, senior center Miles Gally, and senior forward Djordje Orcev. Their combined offensive efforts put the score at 12-4. The Rockets score 10 points in a row at the beginning of the first quarter. Photo by Matthew Rothmann. The Rams were forced to switch to zone defense, each player guarding his allotted area of the court. The Rockets struggled to adjust, and even though RM still played solid defense in the final four minutes, the Rams scored the final six points of the quarter, making the score almost even at 12-10. Both teams took the break to discuss the offensive approaches and how to switch up their defense for the second quarter. And at the beginning of the second quarter, it seemed the Rockets defense was in for a long game. The Rams matched each of the Rockets’ runs, keeping them from gaining a comfortable lead. Despite holding one of the Rams’ top scorers, junior forward Jailen Anderson, scoreless, it looked like the Rockets’ defense could not stop junior center Jimmy Sorunke. After calling a full time out, the Rockets ended the half on a run with three-pointers by Liyanamana and senior forward Brian Sadeghi, with an overall score of 24-20, the Rockets in the lead. With the narrow lead, both teams felt that it was their chance to pull ahead and win. At the start of the third quarter, Anderson finally began to score, connecting on a three-pointer and another field goal to put the Rams up by one briefly. This lead was short-lived, however, as Gally scored the next seven points for the Rockets. He and Orcev also played stellar defense by rejecting a few shots in the quarter, which helped keep the Rockets in the lead, ending the third quarter at 35-31. The noise in the gym was deafening as the fourth quarter began, everyone excited to see who would actually take home the victory. The Rockets started with possession and junior forward Henok Kassahun started the scoring with a triple to put the Rockets up six. Sophomore guard Ryan Cornish hit a tough two on the Rockets’ next possession, then made a three-pointer after a steal to put the Rockets up 43-33. 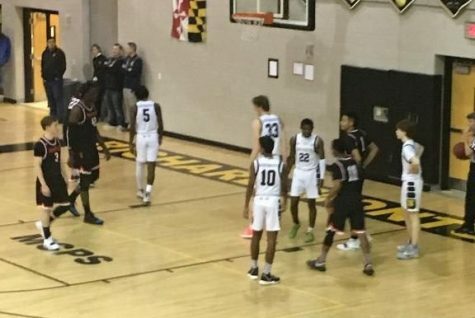 This forced Rockville to call a full timeout to try and fix the problems in their defense. However, they still could not stop the shots by Lewis and Cornish, which put the Rockets up by 16. This forced the Rams to use a half court press against the Rockets. Desperately looking for stops to cut in to the Rockets lead, the Rams ended up getting four key steals in the 13-2 run, leading to shots by Anderson, Sorunke, and senior guard Je’Shaud Armwood. Those shots cut the deficit to 5 with just over a minute left in regulation. The intensity only continued to build in the last minute of the game, beginning with Gally getting fouled and calmly knocking down both of his free throws. With 30 seconds left, however, Anderson connected on a three, cutting the deficit to four. The Rockets made several key passes before the Rams fouled out with only 3.6 seconds left. Lewis ended up sinking both free throws as the final seconds ticked off, putting the final score at 56-50. Rocket players and faithful celebrated not only a game victory, but also a moral victory by beating their rivals in a tight game. However, despite the win, it seems as the Rockets have room for improvement. Despite having more assists and blocks, the Rockets turned the ball over frequently and were outrebounded 31-28. They have seven total games left, their next one being against Northwest on Wednesday, Jan. 30, who they beat 75-73 earlier this season.